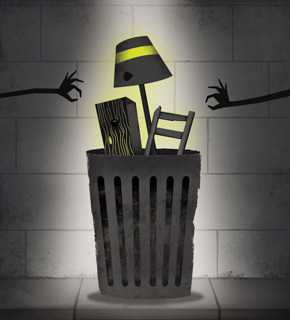 story by Jaclyn Hardgrove | illustration by Zachary KutzLast summer, I started snatching my neighbors’ trash. Paranoid of onlookers, I’d tip toe, concealed by darkness, up to the curb where my neighbors had so politely pushed their waste. I’d sneak around, quickly grabbing objects. But now, after a year of cultivating my own “junk-that-has-potential” sensibility, I’m less concerned with stealth, taking my time to choose carefully. Philadelphians throw away approximately 800,000 tons of trash every year. It’s certainly out of sight, but our mounds of stuff must go somewhere. While stores like Uhuru Furniture & Collectibles offer free pick-up of unwanted furniture, countless commodities still end up curbside on trash day. My own neighborhood is so bursting with stuff that our local thrift store has “Free Bins” lining the sidewalk. Collecting objects piecemeal has been a pleasant process for me because furnishing my third-floor apartment is like building a ship in a bottle—narrow, crooked stairs with bikes lining the entrance sometimes makes it difficult to lug groceries upstairs, let alone furniture. Luckily, in a city like Philadelphia, there’s plenty of opportunity for salvageable items to be absorbed into new homes before the trash truck comes lumbering down the street. My fascination with trash-picking came at an appropriate time—I was unemployed and had little to spend on furnishings. What I could afford was particle board and plastic, so finding wooden drawers with fine details floored me. Glass, metal and wood had me smitten. I was determined to repurpose these objects, rescuing them from their imminent landfill deaths. These goods offered me more than their material dividends. Often coated with dust, clearly neglected long ago by their former owners, these misfit objects gave me a chance to work with my hands—which was a welcome change from my many hours combing job boards (with nothing tangible to show for my efforts). While it’s hard to pinpoint the initial moment when I climbed over the large black trash bags and plucked out my first TV tray or glass vase, Thursday nights soon became dedicated to this activity (the spoils were inconsistent, but all cherished). My resourcefulness seemed to kick into gear: three identical glass vases were transformed into hydroponic gardens; wooden drawers were converted into unconventional shelving (or sometimes pushed under other furniture for additional storage); four nearly-broken chairs became two decent chairs thanks to some allen wrenches. And then there are those objects that hang around, but still have no place: an old window pane, a lattice headboard, a bunch of baskets. In this do-it-yourself age, customization is king. I get giddy (and acquisitive) when I scroll through design websites like Apartment Therapy. But patience has dropped unique end tables and plates on my doorstep (or nearly). There is a certain peace in collecting objects instead of buying things in abundance. Less continues to be more. jaclyn hardgrove lives in Queen Village, and loves cooking and reading in coffee shops. She recently graduated with her bachelors in writing and now works in Center City. She can be reached at jaclyn.hardgrove@gmail.com.